*What a whirlwind day I had today. I just went from one thing to another. *Throughout most of the day, I pulled some of the seniors out of their Government class to talk with them about where they are at in the college process, and hope to keep them on track. *I had a parent show up who needed to make corrections on her student’s FAFSA, and we got that done, and it went very smoothly. Whew!! *Cosette came to KHS today and hung out with Paul, and they both enjoyed hanging around one another. *From 10 a.m. to 10:17 a.m., KHS students gathered in the library to sign posters with the names of the 17 victims of the school shooting in Florida. It was a very moving time, and the students took it very seriously, and many were visibly shaken. Paul and students signing a poster. *After I got home from work, Molly, Travis and I went up to the Sixth Street Theater for a photo shoot. Molly and Travis like to dress like characters and attend Comic Con events. They wanted some photos of them in their outfits, so we spent about an hour with me taking their photographs. It was fun!! *Around 6 p.m. we went to Kellogg High School for an awesome event put on by the KHS Art Department and Creative Writing Class. It was called A Night of Art & Poetry: The timeless architecture of Kellogg presented through drawings & poetry of Kellogg High School students. For the first 45 minutes, you could walk around the cafeteria and look at the artwork students created based on buildings in Kellogg. 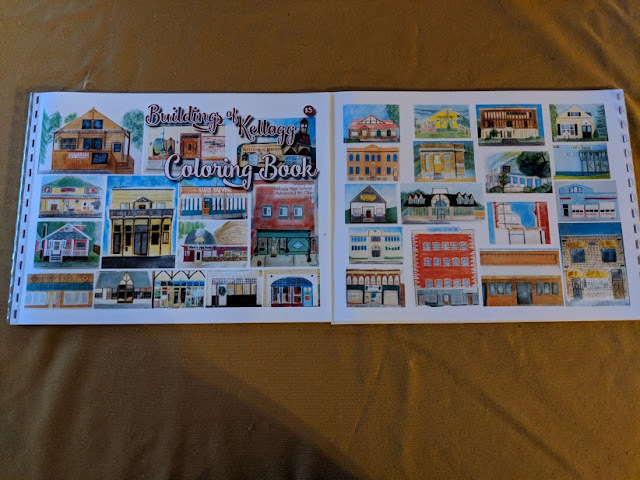 The artwork was for sale for $20 a piece. 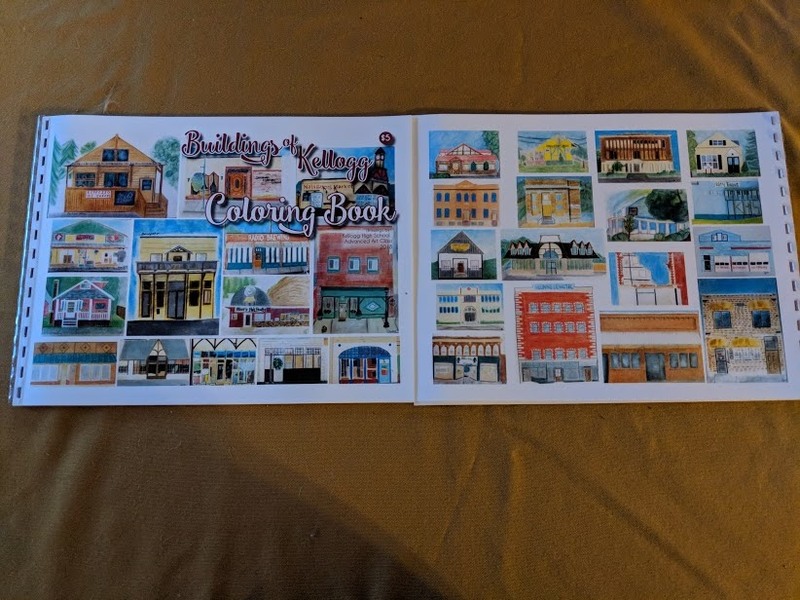 They also created a Buildings of Kellogg Coloring Book that were drawings of the buildings, and sold this book for $5. At 6:45 p.m., 16 Creative Writing students got up to the microphone on the stage and shared their poems they wrote based on the buildings of Kellogg. We heard poems about the McConnell Hotel, a building in Kellogg that burned down last summer, as well as The Bean and Being, written about a local coffee shop, Problematic Bones, based on a Mary Jo White’s Chiropractic building, Dirty Ernies, written by one of the football players who recalls the fans who watched the game from the balcony of this local bar, and Looking Up From the Kellogg Pool, a poem about the old Lincoln school/mall.